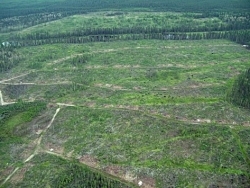 Clearcutting in the Alberta boreal forest. First Nations opposition to the Canadian Boreal Forest Agreement—a deal between forestry industry and ENGOs that claims to protect 29 million hectares of the boreal—is mounting. MONTREAL—A leaked document and email obtained by the Montreal Media Co-op shows major environmental organizations engaging in damage control while speedily attempting to court First Nations' support for the Canadian Boreal Forest Agreement (CBFA). The revelation comes amidst mounting opposition to the agreement from aboriginal organizations, many of which are decrying it as fundamentally flawed. The much-hyped pact between major forestry companies and environmental organizations claimed to suspend logging on 29 million hectares of boreal forest and caribou habitat for three years in exchange for an end to the environmentalists' global boycott campaigns against the industry. The email—sent at the end of a meeting with some First Nations groups last week in Prince George, British Columbia—was written by Larry Innes, Director of the Canadian Boreal Initiative, and Faisal Moola of the David Suzuki Foundation. It describes a forthcoming First Nations “Declaration on the Boreal” and a letter of understanding (LOU) that lays the groundwork for First Nations cooperation with the CBFA. Environmental organizations and forestry companies excluded First Nations during negotiations of the CBFA, despite the fact that most of the lands bargained over were First Nations' traditional territories. The organizer of the Prince George meeting, the Carrier Sekani Tribal Council, revealed in a press release that David Suzuki and Innes had met with them and apologized. Apologies, however, haven't sufficed for a growing number of First Nations, including leadership from Manitoba, Ontario and Quebec, who issued a statement last Wednesday saying the agreement was better left behind. “The CBFA disrespects our rights and was developed without our consent," said Grand Chief Stan Beardy of the Nishnawbi Aski Nation (NAN), which represents 49 First Nations in Northern Ontario. "The meeting this week in Prince George, BC, is a backdoor approach to coming up with a national First Nations strategy regarding the CBFA as there was no consensus that the meeting was a good idea. If we are going to be discussing our role in the management and protection of the Boreal region, it will be outside any agreements such as the CBFA." Innes and Moola lament in the email that “as a 'national' meeting it failed to materialize” but they indicated that they are targeting those regions where Indigenous criticism of the agreement is mounting. NAN called on the Assembly of First Nations to hold "a national meeting on the future of our forests." NAN was joined in their criticisms the CBFA by the Algonquin Nation Secretariat, which represents two bands in Quebec, and the Manitoba Keewatinowi Okimakanak (MKO), which represents 30 in Manitoba. In late September, the Assembly of First Nations of Quebec and Labrador (AFNQL), which represents Quebec First Nations, passed a resolution to boycott any meetings on the CBFA until the organization has conducted a legal and technical review of the agreement. Rather than address the public criticisms of the regional aboriginal organizations, Innes and Moola pinned blame for mounting First Nations dissent on an independent policy analyst and anonymous individuals. Diabo is a policy consultant who works for the Algonquin Nation Secretariat, but has no affiliation with the Manitoba and Ontario bands that also criticized the agreement. He also made it clear that industry representatives had deliberately excluded First Nations from the original CBFA negotiations. “If there was a way to involve all those chiefs and set up some sort of national framework, we would have done it,” he said. The letter obtained by the Montreal Media Co-op did not include recipient email addresses. Martin Lukacs is a member of the Dominion editorial collective and the Montreal Media Co-op. This article was originally published by the Montreal Media Co-op. Mont-Royal to become Open-Pit Mine? Submitted by Robert Johnston (not verified) on Thu, 2010-10-28 08:59. I don't understand the position taken in this article. Isn't it a good thing that environmental organizations are trying to foster closer relationships with First Nations? Isn't an official document, such as a protocol for a relationship, a good thing? Everyone is scared to put words on paper because they feel it legally binds them, so isn't it a progressive and trusting development when a group is willing to take this risk and do so? My understanding is that the Carrier Sekani actually invited NAN and others to the meeting and that this was a meeting organized by them to discuss resource development in their traditional territories. Again why is this being framed as a bad thing? Submitted by dru on Fri, 2010-10-29 23:36. ...is that they signed an agreement, and now they're trying to get FNs to sign onto it without ever having involved them in the first place.